An evening gold finch visitor, and the pleasure of sharing the birding fun with a sweet friend. Gorgeous photo of such a sweet, soft and delicate bird! My new favorite place to hang out is on my bed where I have a perfect view, dare I say, birds-eye view of the finches feasting. As I type, there are 6 birds - wait, now 7 - chittering and chirping while eating their morning seeds. After seeing your photo - I'm wondering if I could move my feeder where I get better light... hence better photos. This feeder is in the shade of our tree. If I move it to better light, I lose my front row viewing. Hmm... dilemmas. Thank you for sharing the delights of these little birds with me. What a gift they are. Ha! I took my camera outside, thinking: I hope I can get a shot as nice as Janece's! You're watching birds from your bedroom window?? I wouldn't change a thing! Perfect shot! Do you know what kind of bird it is? He's a Gold Finch. 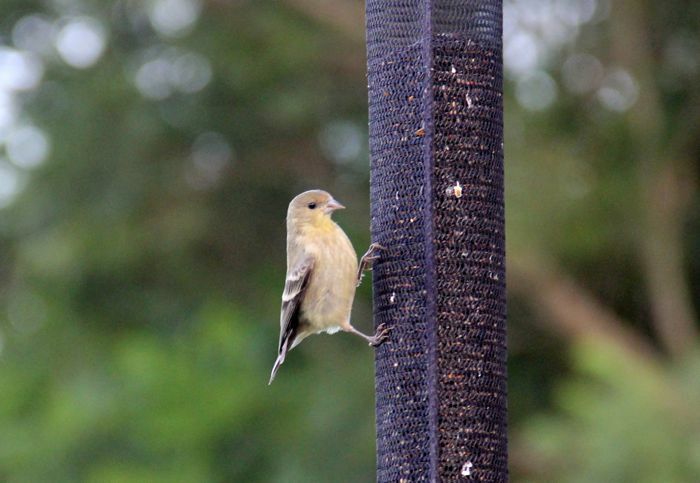 I don't where they've been hanging out, but now we have the feeders we are visited by dozens... and they're voracious!